This article was first published in the July 1995 issue of Wingspan, the inflight magazine of Japan’s All Nippon Airways and was later reprinted in Morning Calm, the inflight magazine of Korean Air. It was my first trip back to Russia since 1992 (see related article). Musicians in Russian folk costumes welcomed us aboard the M/S Alexander Griboyedov with balalaika music. 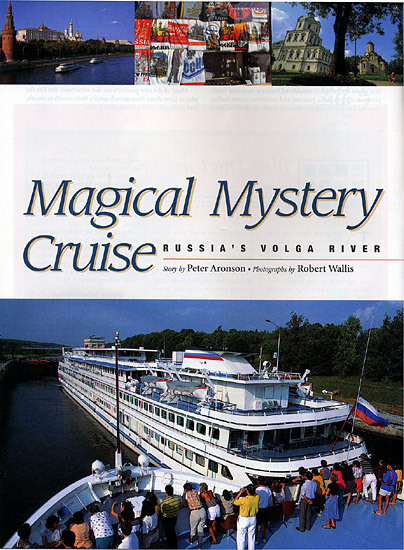 The 424-foot ship was broad, bright, and very well-apportioned by Russian standards — “the pride of the Russian fleet,” according to our brochure. There was a fully-stocked Western bar, a large, immaculate dining room. even a casino. Our group would spend a few days in Moscow before leaving for its river adventure. The Alex G., as everyone called it, would serve as our floating hotel. Our first excursion into Moscow took us near Red Square, where we saw people discovering what was still a fairly new ideology: consumerism. Fewer and fewer Muscovites were showing up at Red-flag- waving rallies these days; more were fascinated with pitches for products like Gherbalaif (“Herbalife”). We strolled down to the Moskva River, a polluted but stately waterway that runs through central Moscow. At night, its surface reflects the bright red stars of the Kremlin and golden onion domes of the Annunciation Cathedral. We boarded a tour boat. Drawn by its beautiful domed roof we disembarked near the Novospassky Monastery. On the way there, we stumbled upon a crowded pond, where we found the real inner- city Moscow sunbathing, drinking, and splashing. The acrid smell of state-brand cigarettes and beer and the din of cheap radios filled the air. Two militia officers questioned a man with a pile of beer bottles next to his car. Three teenage boys picked up a girl by her arms and legs and tossed her, giggling and squealing, into the murky water. 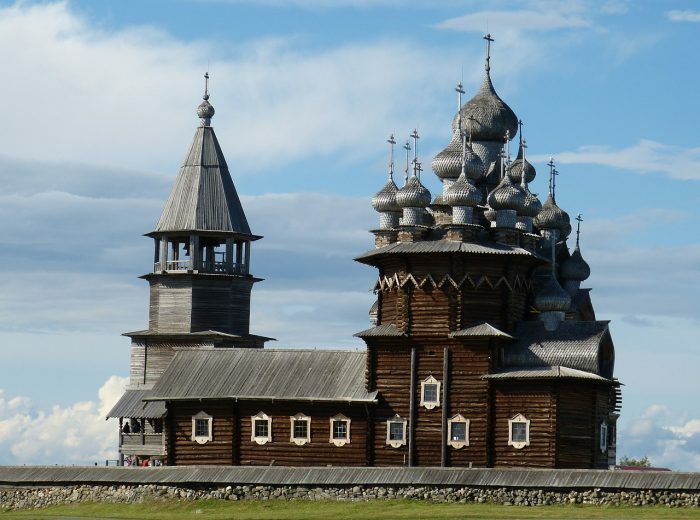 l wondered what the 500-year-old Novospassky Monastery was thinking as it looked down on the spectacle at the pond. For centuries, the pond had been a clean, pure source of fish for the monks living there, but after authorities closed the monastery in the 20s, the pond, like the rest of the place, was neglected and abused. We walked up to the monastery pausing at the gates as several elderly women in dark kerchiefs bowed and crossed themselves three times before entering. In the courtyard, there were many more like them, contemplating the flowers and praying. The sun concentrated on Brother Nikolai in his heavy black habit and he dabbed his young shock of red hair with his handkerchief. As we walked, he showed me the tombstones spaced evenly around the perimeter of the courtyard. “We don’t know whose body lies where,” the monk admitted. Over the years, vandals had kicked the grave markers around and piled them up in heaps. “We just put the stones where they look nice,” he said.